As a child, Halloween was probably my favorite holiday of the calendar year. As an adult, Halloween is definitely my favorite holiday of the calendar year. Sure, I no longer get to experience the hedonistic joy of going from house to house, begging strangers for candy, but hey, I have a job, right? Turns out, you can just buy a bunch of candy at the store, and no one knows you didn’t put in hours of work to obtain it! What a country! Still, there’s something magical for kids about the art of trick ‘r treating. Perhaps it’s the randomness and the lottery nature of the candy you receive—as you walk up to each house, you’re basically trying to strike it rich with the candy variety of your dreams. Sometimes you strike out (toothpaste, dehydrated apple slices … Raisinets), but sometimes you hit a home run (full size bars! ), and the resulting rush of achievement is something I still remember fondly to this day. As it happens, though, what kind of candy you receive is actually highly dependent upon where you reside in the U.S.A. Using 11 years of sales data, the website CandyStore.com generates a yearly list of the most popular Halloween candy purchased in each state, and they happen to be remarkably different, depending on where you are. All in all, more than $2.6 billion is estimated to be spent on trick-or-treating, which makes the below map into a representation of big candy business. Intriguingly, a significant percentage of that candy is now being purchased online. Let’s call out some of the particular oddities here. 1. My home state of Illinois is not only the only state of the Union where Kit Kat bars reign supreme, it’s only the only state where they even appear in the top three! What’s up, U.S.A.? Am I the only one who loves chocolate covered wafers in this country? 2. Saltwater taffy has the odd distinction of being the #1 candy in both Washington and Nebraska. Washington, one can almost understand—at least it’s on the ocean. But Nebraska? The hell? 3. Hot Tamales are all over, taking the #1 candy spot in states such as Indiana, North Dakota and Virginia, while also appearing in the top three in Wisconsin, New York and South Carolina. Speaking as someone who can’t ever remember receiving a box of Hot Tamales while trick or treating for more than a decade: Who are these people, and what is their Hot Tamale fascination? 4. In Montana and Oklahoma, the most popular single choice is Dubble Bubble gum, which must rank among the lamest things you can receive in a Halloween bag, right? 5. Despite the hate, Candy Corn remains ubiquitous all over. As a rare candy corn zealot and defender, this pleases me. With that said, it better be Brach’s Candy Corn, or you can get right out of town. 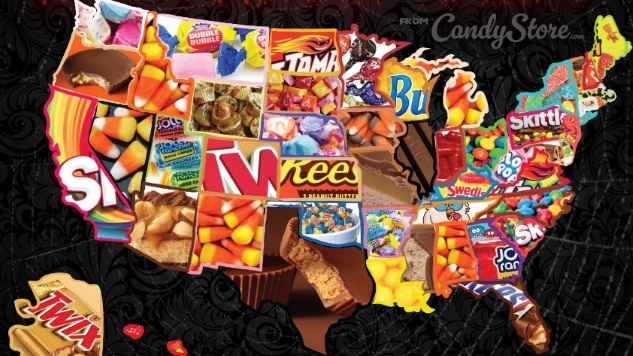 Anyway, here’s a top 10 of the most popular candies, with all the states taken into account. For a whole lot more data, check out the source here.